One of the challenges with these old Onans is the ignition system. Those of you that have priced the points and coil for this beast know what I mean. So I made a mission of seeing what it would be like to convert this to using an electronic ignition system. First thing I did was to look for a suitable coil for the job. I found a Toyota UF180 the most suitable. 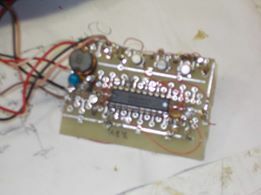 It has integrated electronics so only needs an appropriate low current trigger pulse. And, it is cheap! I got one on EBay for $12.79, free shipping! I'll leave the old stuff below. I went to my friend's place this morning with an upgraded firmware on a chip. The verdict is in. As long as the calculations for the next firing is done with the measurement from the previous cycle, the engine will run flawlessly. The first version was working on numbers one cycle back from that and it just was not solid. It was just the way the software evolved, I knew I needed to be as close as possible, and now that is the case. So the stuff below about two magnets is out, unnecessary. The objective was to start the engine on TDC and advance the spark as the engine sped up. This is the best way to go as the battery doesn't have to work against an advanced spark on start up. The only thing I can think of adding from here is a pot on the box so the spark advance can be trimmed with a timing light. And this won't be necessary, it is just that it is pretty simple to do. If the installer just wants to go with good enough, leave the pot centered. color 1: less than 59 Hz. color 2: between 59 and 61 Hz. color3: greater than 61 Hz. The MSP430 sports a watch crystal so measurements would be spot on. So, it was a good day. David lives off grid and it has been cloudy. He has been running a back up generator on gasoline. But he has a natural gas fissure on his property. Last fall I created version three of the natural gas compressor. (I'll post about that later.) Back in the 60s there was enough pressure from the cap that it could be used directly. Not so much today, maybe the drought?. He runs his water heater from the gas and there is a leg of the line up to the energy shack. This generator was fitted for propane. But the mixer reaches the 2.5" of gas and the heat content of the gas so that the generator runs just fine. We ran it on and off for an hour using ~2500 watts to charge the batteries. Next couple of months we are looking to get good water from down the canyon. Here is the start of that project. The first thing was to bread-board a driver for this coil. From what I've read these things like a 3 millisecond charge time to build a magnetic field for a good spark. That works, it created a wicked spark, over an inch and would light paper on fire. Of course a bread board won't cut it as the generator has quite a bit of vibration. 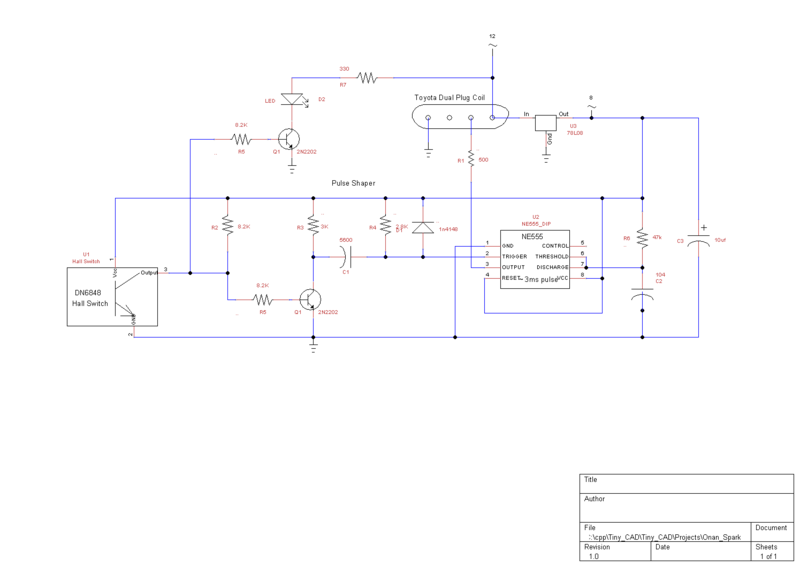 So once I was satisfied with the circuit I drew up a schematic so I could soldered it up on a prototype board. I put it in a box with connectors and plugs so it would be easy to handle. Here you can see the Hall sensor to the right. Close up of the Hall sensor. I mounted it on a stiff piece of PC board as it has to be positioned over the flywheel. Here is the schematic. Hover over for a full size look. 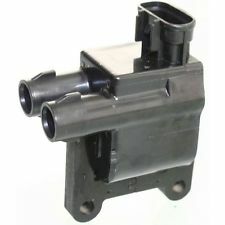 Here is the Hall Sensor in place on the engine. Notice the magnet on the flywheel above the board. This is one of those really strong rare earth magnets, it will not move. I'll guess it takes many hundreds of Gs to move that magnet and those kind of forces won't exist on the flywheel. I did put a timing light on the igniter box. The light will go off when the magnet is under the Hall sensor so turning the flywheel to the right just until it goes on is where the sparks will fly, three milliseconds later. Well, that is a problem. It will still run very retarded at full speed. Version 2 will have a micro processor, something like an MPS430G2211. All that is really needed is one timer. The game so far is proof of concept, the engine runs beautify even if it is wrong. Last night I started programing an MPS430G2211 for version 2.0. Everything else will stay in place, it is just a matter of swapping out the dumb electronics with a brainy controller.. A true ECU, at least, for the spark. incremented/decremented (Timer_A/Timer_B does not need to be running). For having a pretty lame tach this thing works rather well! 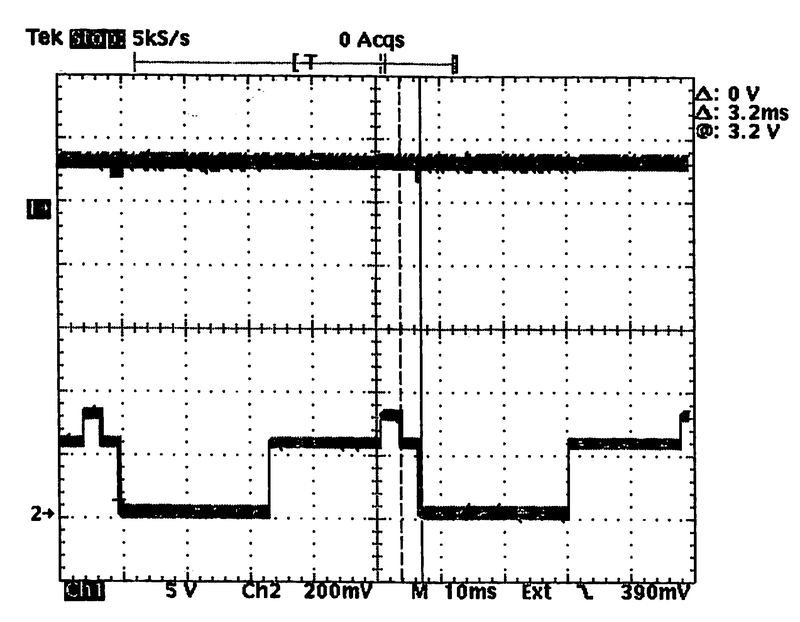 Here is the code and the result of the the proxy motor running at about 1000 rpm. I've run it on the actual motor and watched the spark with a timing light. The objective is to keep the infrastructure of this system as simple as possible. 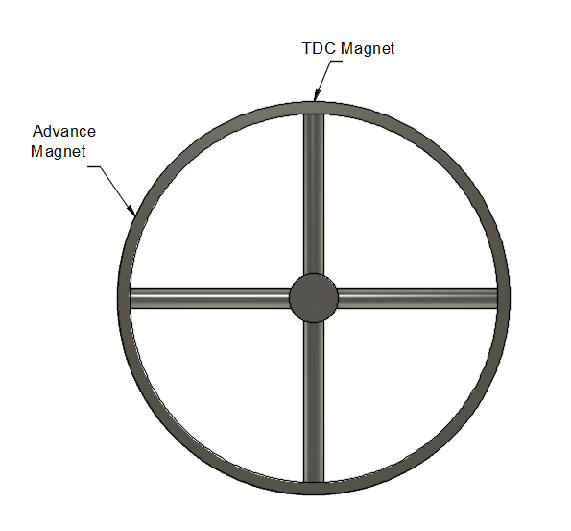 By using two magnets on the flywheel, one north facing and the other south facing up, it will be possible to measure the motor speed almost in real time. And then two Hall sensors on the same board mounted with sense at opposite magnetic polarity. Copyright © 1996 - 2018, Highlands Electronics All Rights Reserved.